sailboat. : Giveaway: Liladees Jewellery - win your favourite item! Giveaway: Liladees Jewellery - win your favourite item! Hello lovelies! Today I have a super sweet giveaway from one of my November advertisers, Liladees Jewellery. The thing I love most about this online jewellery & accessories shop is how adorable and completely affordable everything is. Liladees is giving one of you the chance to win your favourite piece from the website! There are so many pretty things, so there's plenty to choose from & something for everyone! 1. Pop over to the Liladees website, choose your favourite item & leave a comment below this blog post letting me know what it is! 2. Leave a contact email address or twitter name so I can get in touch with you if you win! 3. If you would like extra entries you can follow Liladees on Twitter and Facebook. Just let me know that you've done it! 4. You must be a subscriber of my blog! 5. Please get your parents permission if you're underage as I'll need your postal address! 6. The giveaway will be open for one week & will close on Friday 23rd November at midnight GMT. 7. I'll pick a winner at random on Saturday 24th November! I love the white mask ring! Reminds me of being in Venice! I've followed them on twitter. Mine is @coco_tbm. I would love the Vintage Effect Swallow Bow Wing Stack Rings, i always find small things like that make everything look better! I will deffo be adding some of the pieces on the website onto my birthday list! My favorite item is the gold cross friendship bracelet! 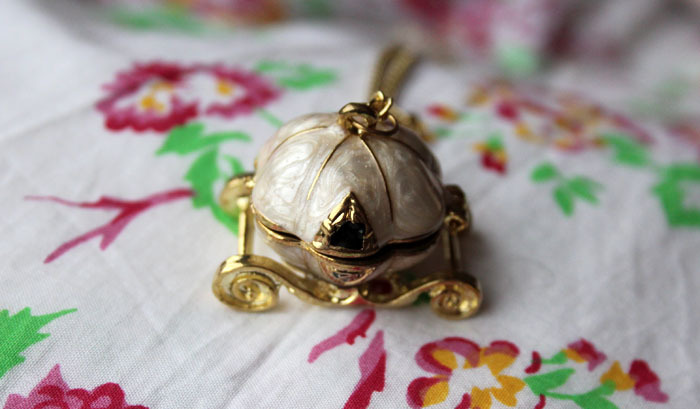 I think my favourite item is the Cinderella carriage necklace, like the one in your photo, it's so pretty and pearly! My favourite piece is Gold Cross Friendship Bracelet :) Looks amazing! good luck girls! my fave piece is the 6pc gold/pearl earring set. My fav is the Antique Gold Effect Crystal Wing Ring! My favourite is the Cinderella's Carriage Locket, so reasonably priced too! My favourite is the prism stud and ear cuff although the cinderella necklace is just adorable! wow, such an adorable blog! LOOOOVe it! My favourite is the cats ears ring - so cute! I've followed on Twitter @hels89. My favourte is the Cinderella carriage locket. My fav piece is the Burnished Gold Effect Crystal Owl! Hi my favourite is the Cinderella carriage locket. i am following you on twitter with the name PlaygroundLoove. i love the Vintage Effect Cinderella's Carriage Locket. Hey, My favourite items are either the owl pendant necklace or the Cinderella's Carriage necklace. My twitter is rosaliejayne and I am also following liladees on twitter. I love the Hot Air Balloon Necklace!